Sports -Usain Bolt won the men’s 200m to claim his eighth gold at an Olympics, and keep alive his hopes of an unprecedented ‘treble treble’. The Jamaican ran 19.78 seconds to come home ahead of Canada’s Andre de Grasse and France’s Christophe Lemaitre. Britain’s Adam Gemili clocked the same time as Lemaitre, but was denied his first Olympic medal in a photo finish. Bolt, 29, has already won the 100m in Rio and will run in the 4x100m relay final on Friday. The Jamaican, who said in February he would retire after the 2017 World Championships, has won all eight of the Olympics finals in which he has appeared. “The fact I came here and executed what I wanted to is a brilliant feeling,” he told BBC Sport. Only US sprinter and long jumper Carl Lewis and Finnish long-distance runner Paavo Nurmi have won more Olympic gold medals in athletics. Lewis won nine golds between 1984 and 1996, while Nurmi also won nine between 1920 and 1928. “What else can I do to prove I am the greatest? I’m trying to be one of the greatest, to be among Ali and Pele,” added Bolt. So the slow time – by his standards at least – left the Jamaican gesticulating angrily as he crossed the line more than two tenths of a second ahead of De Grasse. 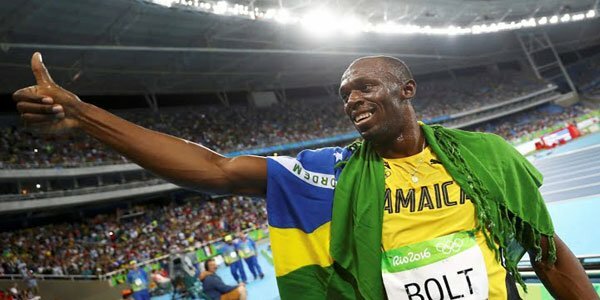 But Bolt quickly broke into a beaming smile, celebrating with a trademark ‘Lightning Bolt’ as thousands of fans chanted his name.